WebM and HD Video support. New JS values for executing heavy, numeric code more efficiently for cleaner graphics and a better browsing experience. Multi-touch support for Windows 7. 3D the Web support with WebGL. Audio API through <video> and <audio> elements in HTML5. Retained layers for fast scrolling on complex web pages. XPCOM module improvements for better extensions framework and fast startup. Support for new CSS3 features like Transitions and Transformations. More Form features like list attributes and HTML5 validation. HTML5 parser with full support for web video, audio, drag & drop, and file handling. Web Console web pages analysis tool. JetPack SDK to develop add-ons which can be installed without restarting the browser. Full hardwareacceleration with Direct2D and Direct3D on Windows, XRender on Linux and OpenGL on Mac. Use SVG as images and backgrounds in Firefox. Crash protection from crash in the Adobe Flash, Apple Quicktime or Microsoft Silverlight plugins. HSTS for sites to request Firefox to automatically establish secure connections to their servers (https). 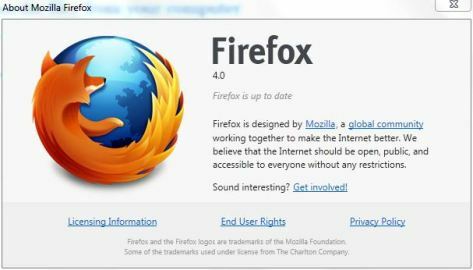 Prior to official release, the final build of Firefox version 4.0 has been published on the Mozilla FTP server, and is available for Windows, Mac OS X and Linux (in the name of Firefox Setup 4.0.exe, Firefox 4.0.dmg or firefox-4.0.tar.bz2) for various supported languages. In fact, the final version of Firefox 4 is exactly the same with Firefox 4 RC2, according to the PGP signature been published for final and RC version. It means that the Firefox 4 RC2 will be released officially as Firefox 4 (if there is no bug or showstopper been found), and by installing Firefox 4 RC2, you have already actually installing the final version of Firefox 4, and not required to upgrade.